As an established company, we would like to offer a discount for new enquiries from the 1st January 2018 to the end of February 2018. Discount of 20%, this means ZERO vat on all invoices! Our experts can advise and implement the perfect solution for your specific fencing requirements. At Green Garden Services 1946 Ltd we can create bespoke and easily-maintained planting schemes to enhance your garden. Well ... it's the start of another New Year, 2019! We are set to grow yet again as we have over past years. We have over 100 Checkatrade reviews, with scores over 9+ ! Our team try very hard to add service levels to every job. This includes providing small extras that are not always on the job list, to help set us above the rest! In turn, this helps our growth and we are actively looking to take on extra staff for the year. If you are interested in working with us, please get in touch. WITH 20 YEARS EXPERIENCE IN THE GARDENER CRAFT, GREEN GARDEN SERVICES 1946 LTD OFFERS GARDEN CARE/LANDSCAPING TO CUSTOMERS THROUGHOUT THE LOCAL AREA. FOUNDED IN 1980, THE BUSINESS IS SITUATED IN HAYWARD'S HEATH. The team have over 60 years of experience in garden services. Pam starts the year off in the greenhouse/poly tunnels by selecting seeds and cuttings for the start of spring. Tony undertakes all general garden services with care from start to finish including lawns, lawn scarifying, hedges, borders, light and heavy pruning, fencing and garden furniture maintenance, including sheds and greenhouses. All green waste can be taken away for recycling. Jeff has 20 years experience of creating landscapes, drives, tarmac, slab and interlocking block paving. With a large team of four full time designers, Green Garden Services 1946 Ltd has years of qualified experience. Green Garden Services 1946 Ltd has a steady network of clients, situated throughout Haywards Heath, Cuckfield, Burgess Hill, Newick and the RH16 & RH17 post code areas. The company is managed by Tony Hardy who has been involved in the garden maintenance business for many years. Tony Hardy is well trained to oversee the company, having previously been on the steering committee at Haywards Heath Town Council for Britain in Bloom. With a well equipped treatment centre and fully qualified staff, the services provides a professional care for large and small gardens. The services are designed to be cost effective, enabling clients to enjoy their gardens and increase the value of their property. Good quality graded top soils, this can be machine mixed with multi composts, inc lawn sand, mushroom compost, very good for a top soil dressing & a top mulch, this helps suppressing weeds, breaks down heavy soils such as clay, hence assists in drainage. All above products can be delivered & spread to your borders. We can also supply, trellis panels in any size made to order, erected , garden sheds built to order & erected including new concrete basis. Fence panels either standard sizes or made to order, in some cases we can save you money rather than fit new posts that have rotted we can save the posts by fitting concrete Spurs ( posts) these come in various sizes from 4 feet to 6 feet, how do we do this, pull the damaged post upright ensuring it is level, dig a hole around 2 feet deep, set the new concrete spur in back fill with fast setting concrete, then coach bolt the original wood post to the concrete spur, last for years, saves you lots of money. Green Garden Services 1946 can meet all of your garden fencing needs, including gates, trellis and fencing repairs in Haywards Heath, Cuckfield, Burgess Hill, Newick & all surrounding areas. If you would like a Free Quote or more information on any of our Gardening Services then please Contact Us. "Many thanks again for another great job completed. 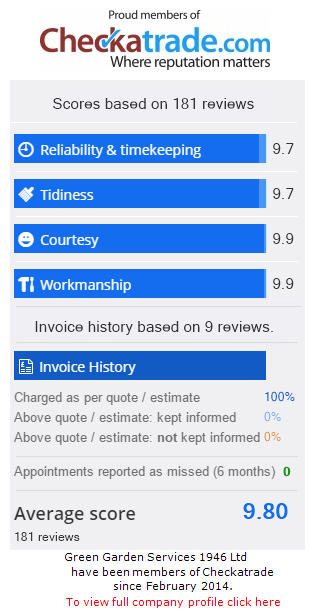 I am really pleased with the result - it has certainly lightened up the garden..."
"From my initial enquiry to completion first rate service in every respect." "They made an early appointment and arrived on time, did the job and cleared up thoroughly. The charges were also reasonable."